View images in a collection of Photo Galleries. Watch video of penguins at play. 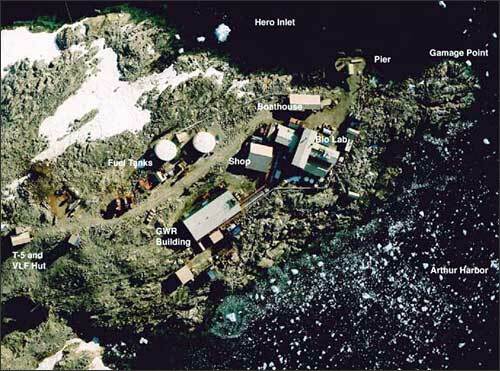 Palmer Station is the smallest of the three U.S. stations in Antarctica with only around 40 inhabitants on average. Palmer was established almost 30 years ago on Anvers Island south of Chile for biological, environmental, and atmospheric research. The weather at Palmer Station is relatively mild, compared to the rest of the continent, and its abundant wildlife makes it an ideal place to study Antarctic marine biology. During the coldest months it is -14° F, and at its warmest, temperatures reach 36° F.
WBUR's Dan Grossman spent five weeks at Palmer Station. Meet the men and women who live and work there. In our overwintering special, see 38 years of Palmer Station staff, spending winters on the isolated Antarctic peninsula. 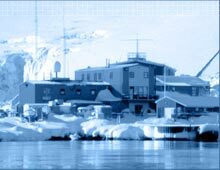 Learn about the buildings and facilities at Palmer Station, Antarctica.